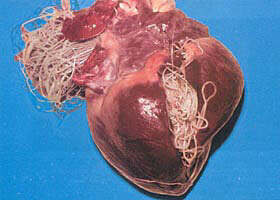 Heartworm disease in cats is extremely hard to detect. However, research has shown that it is becoming more and more prevalent! One of the biggest misconceptions is that heartworms are just like any other worms – how very wrong that is. Although a case of round worms can make your loving family member feel pretty cruddy – an undetected case of heartworms can kill them!!! · Safe to use on Cats 8 weeks of age and older. · Applied topically and absorbed systemically. · Works effectively for up to 30 days. · Also prevents and controls flea infestations. · Treats Ear Mites, Hookworms, and Roundworms. · Safe to use on Cats at least 9 weeks of age and 2lbs. body weight. · Works effectively for 30 days. · Also prevents Fleas, Roundworms, Hookworms, and Ear Mites.